This chapter describes the plight of Georgian Azeris. This ethnic minority stands out in the three countries not only by its sheer size but also due to the dead end that the breakup of the USSR pushed them into exacerbated by the contradictions between jus soli policies in Azerbaijan and Georgia, both intra lege and de facto. 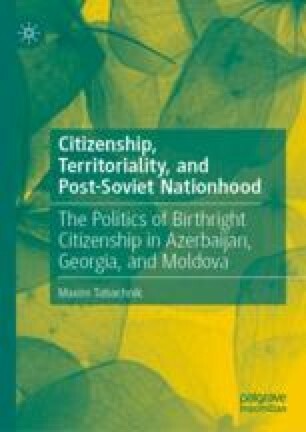 Their plight describes how the politics of territorial citizenship dramatically affect the lives of large groups of people. Moreover, the strengthening of jus soli in both countries remains this minority’s major hope in the task of the normalization of their situation. Abbasov, Shahin. 2011. Azerbaijan and Georgia: A Migration Success Story Takes Shape in the South Caucasus | EurasiaNet.Org. Eurasianet.Org. http://www.eurasianet.org/node/64162, accessed August 14, 2015. Brubaker, Rogers. 2000. Accidental Diasporas and External “Homelands” in Central and Eastern Europe: Past and Present. IHS Political Science Series 71. https://www.researchgate.net/publication/277118447_Accidental_Diasporas_and_External_Homelands_in_Central_and_Eastern_Europe_Past_and_Present_IHS_Political_Science_Series_71_October_2000, accessed December 22, 2015. Ethnic Groups by Major Administrative-Territorial Units. 2002. National Statistics Office of Georgia. http://www.geostat.ge/cms/site_images/_files/english/census/2002/03%20Ethnic%20Composition.pdf, accessed August 14, 2015. Ethnic Minority Training Center Launched. 2014. Ministry of Education and Science of Georgia. http://mes.gov.ge/print.php?id=5094&lang=eng, accessed August 13, 2015. Fuller, Liz. 2009. Georgia’s Azeri Minority Treated As “Second-Class Citizens.” Radio Free Europe Radio Liberty. http://www.rferl.org/content/Georgias_Azeri_Minority_Treated_As_SecondClass_Citizens/1621243.html, accessed August 29, 2015. Кaндидaтa Oт EHД Лишили Peгиcтpaции в Mapнeyли. 2014. Гpyзия Online. http://www.apsny.ge/2014/pol/1402028844.php, accessed July 21, 2015. Opyджeв, Payф. 2010. Mиниcтpa Пo Дeлaм Диacпopы Гpyзии Haкaзaли Зa Лживoe Зaявлeниe, Ocкopбившee Aзepбaйджaнцeв. RusArticles. http://www.rusarticles.com/politika-statya/ministra-po-delam-diaspory-…azali-za-lzhivoe-zayavlenie-oskorbivshee-azerbajdzhancev-1742795.html, accessed August 10, 2014. Cyд oтмeнил peшeниe ЦИК Гpyзии o cнятии кaндидaтa EHД. 2014. Regnum. http://www.regnum.ru/news/polit/1812768.html, accessed July 21, 2015.